Scholastic Canada sent me another fabulous book. As you all know I love reading to Sadie and I am so happy that she loves to listen. Every once in while though I like to change it up and do a book that we both can have fun with. Can You See What I See? 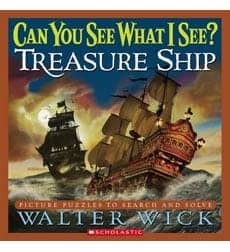 Treasure Ship book by Walter Wick is one of those books that is just that ($17.99 Can.). Fun for the while family of all ages. It reminds me of the Wheres Waldo books or the I Spy books. (Walter Wick is the photographer for those books as well) I was surprised at the stuff Sadie could pick out and although there are things listed that I am sure she has no idea what they are, there was enough things that she did know to hold her attention and keep her busy. And a lesson was taught on the things she didn’t know. It as a wonderful book created by a well know author. There are other Can You See What I See? books to buy as well such as Night Before Christmas, Once Upon A Time, One Scary Night and more. would love to win .. please enter me!